Urban Economics 8 Edition Over the course of two decades, Urban Economics has achieved a worldwide audience, and has been translated into Chinese, Greek, Russia, and Korean. Like the seven previous editions, this edition provides a clear and concise presentation of the economic forces that:(a) cause the development of cities;(b) determine the spatial form of cities;(c) cause urban economies to grow or shrink;(d) generate urban problems such as poverty, crime, and congestion;(e) make the market for urban housing unique; and(f) shape the tax and spending policies of local government. In addition to developing the basic concepts of urban economics, the book uses economic analysis to evaluate the merits of policies designed to address our most vexing urban problems. 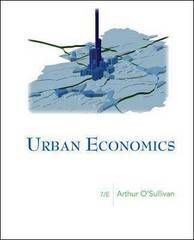 The text is designed for use in undergraduate courses in urban economics andurban affairs. It could also be used for graduate courses in urban planning, publicpolicy, and public administration. All of the economic concepts used in the book arecovered in the typical intermediate microeconomics course, so students who havecompleted such a course will be able to move through the book at a rapid pace.